Your new SPF roof can be installed without removing the existing built up roof. Tearing off a roof is costly and can be a large inconvenience to a building’s tenants due to noise and dust falling from the roof deck. Also, foaming over an existing roof reduces liability for all parties as the roof is never “open” and subject to catastrophic water damage. The SPF roof will be the last roof ever installed on the building. 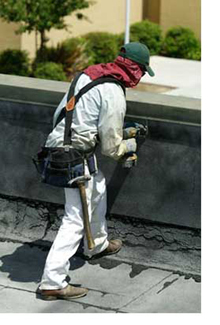 With proper maintenance and recoating at 20 to 25 year intervals the SPF roof should last the life of the building. This reduces a building’s life-cycle costs and is also environmentally friendly. By breaking the cycle of tear-off and re-roof the burden on landfills due to roofing debris is eliminated. Due to the sprayed in place nature of SPF it can be installed in varying thickness to promote drainage, fill in low areas and eliminate ponding. Ponding is the bane of all roofing systems as it causes rapid deterioration and leads to premature failure. Ponding water is heavy which causes deck deflection which causes even more ponding. Re-roofing with SPF stops this snow ball effect. CCC has developed comprehensive installation guidelines as well as over 140 installation details. These are used by CCC’s estimators to design your new roof and are incorporated into the contract documents. They are then used by CCC’s crews to ensure that your new roof is installed as specified and satisfies CCC’s quality control requirements as well as the client’s expectations. As part of the re-roofing process CCC will replace all edge metal andwill upgrade mechanical equipment supports to work with SPF roofing. Wood pipe support blocks are replaced with fiberglass reinforced polyester (FRP) blocks. The end product of this work is a roof system that is isolated from the other components of the roof. For example an HVAC unit can be replaced without disturbing or damaging the roof. A deteriorating wood sightscreen will not lead to roof leaks. In most cases CCC can re-roof a building without removing the HVAC equipment or disrupting the tenant’s operations. While there is a small amount of noise associated with the preparation work, the impact on a building’s tenant is much less than the impact caused by other types of re-roofing. Let us evaluate your roof to see if it’s a candidate for an ElectroRoof® installation. With a photovoltaic array you can convert an expense to a revenue producer.